Welcome to the Elftones' corner of the web! Elftones(elf´· tohnz) pl.n. A popular, highly energetic North Carolina-based band composed of a fiddle player (Mara Shea) and a guitarist (Roger Gold). 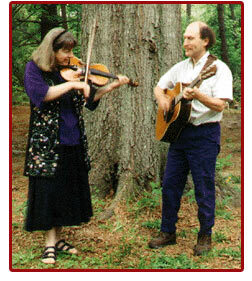 Our music is a blend of Irish, Scottish, Canadian, old-time, and original tunes. We like to play for contra dances, weddings, parties, and just about anywhere people like to twirl and swing and have a great time. Although our home base is in North Carolina, you can find us playing in a large part of the U.S. (and elsewhere when invited). See our Schedule page for our current calendar. If you'd like to hear our music for yourself, we have two contra dance music CDs, The Moon and Seven Stars, and our first recording, appropriately enough called Elftones. If you like waltzes, you'll like our album of waltzes, Mist-Covered Mountains. We also have a wonderful CD of Celtic ballads and instrumentals, All the Pretty Horses, with Rhiannon Giddens (that amazing singer from the Carolina Chocolate Drops), available on our Recordings page (US orders only, please). If you enjoy our music, and Rhiannon's lovely, lyrical voice, you will enjoy this album! Listen to some of our sound bytes from all of our recordings on the Recordings page. Copyright 2015 The Elftones; All rights reserved. the Elftones unless explicit permission is granted within the text of the page.